CENTURY MEDIA RECORDS is proud to announce the worldwide signing of British heavy metal outfit SAVAGE MESSIAH, who will release their fourth full-length album, entitled Hands Of Fate, on October 27, 2017. Recorded at Rockfield Studios Monmouth (BLACK SABBATH, RUSH, QUEEN), Hands Of Fate was produced by Scott Atkins (CRADLE OF FILTH) and mastered by Dave Collins (METALLICA, SOUNDGARDEN, LINKIN PARK). The cover art, as seen below, was completed by Travis Smith (AVENGED SEVENFOLD, OPETH). 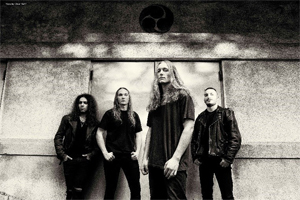 SAVAGE MESSIAH are excited to reveal the first listen with the music video debut for the album's title track, which can be seen on KNAC.COM right HERE. “Hands Of Fate” is also available as a digital single on all streaming and download platforms along with being offered as an Instant Grat track on iTunes and Amazon. Get it HERE.